We thought we'd give you early birds a different kind of challenge to warm up your creative eye before all the other challenges begin! We know you all love the creations of the amazingly talented w&w ladies... but just how well do you know your Talent? We've got a Matching Game Challenge to find out! 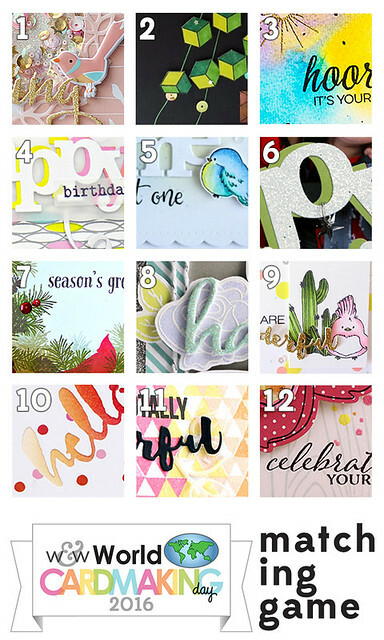 Simply match the numbered images with each designer for a chance to win a $25.00 credit to the w&w shop! All of the cards featured in this game can be found on the w&w blog, so it's also an excellent opportunity to browse the archives and be inspired all over again! To enter, simply leave a comment matching each number to each designer! We will draw one winner from all of the correct entries. Best of luck! What a WONDERFUL way to start our day!!! This was fun, but a little tough! Looks like I'm not the only one! Thanks for a nice wake-up game! 1.Lea, 2.Keren, 3.Heather H, 4.Lydia, 5.Kate, 6.Kelly, 7.Gayatri, 8.Heather P, 9.Laura, 10.Vanessa, 11.Mayuri, 12. Shay! Oh, I remember seeing these! 1 Lea, 2 Keren (amazing) 3 Heather H 4 Lydia 5 Kate 6 Kelly 7 Gayatri 8 Heather P 9 Laura 10 Vanessa 11 Mayuri 12 Shay! Some of these Were very tricky. Its amazing how many I remember!!! Such a cool idea for a challenge!!! What a walk down crafty memory lane! Well....it took me quite awhile (with my slow loading internet speed) to find them all....but I managed it. Very fun rerun of older projects!! I recognized Shay's card right away but there are so many wonderful creations from your DT! Wow was this challenge tough! I recognized a few, like #2, #7 and #9, but then it took me forever to find the rest. I admit that I just guessed at the end with what was left over but here goes! Thanks for this fun opportunity. Not gonna lie, this is too hard for me unless I copy and paste and that seems unfair...but I'll still browse the archives a bit. What a great challenge - although many have gone before me I am still having a go - as someone said above it is great being reminded of the different techniques and I am certainly going to have a go at some of them when I get to my work table! Great and fun opportunity to go back and check the wonderful projects by each designer. Thanks.